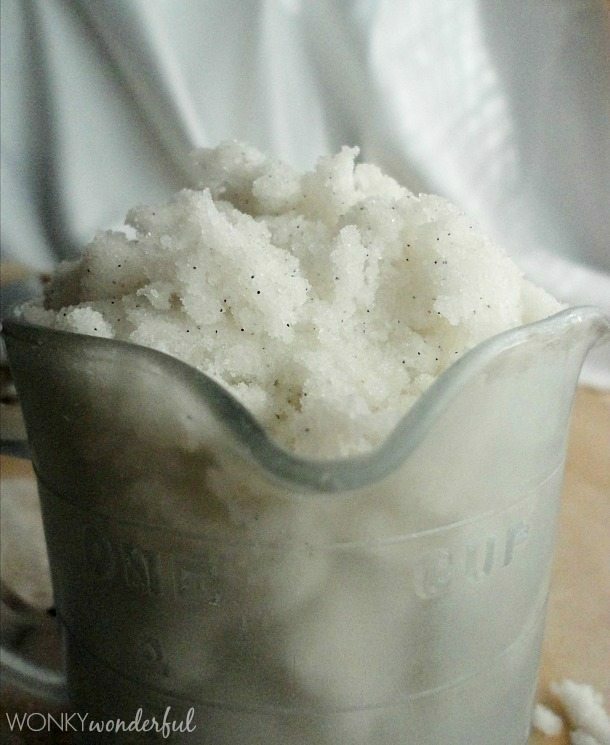 This Homemade Body Scrub is simple to make and inexpensive. 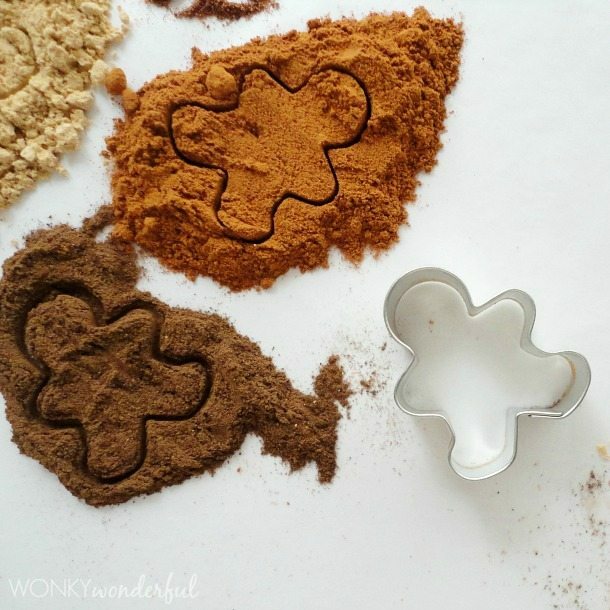 Keep this 3 Ingredient Sugar Scrub Recipe for a great last minute gift idea! 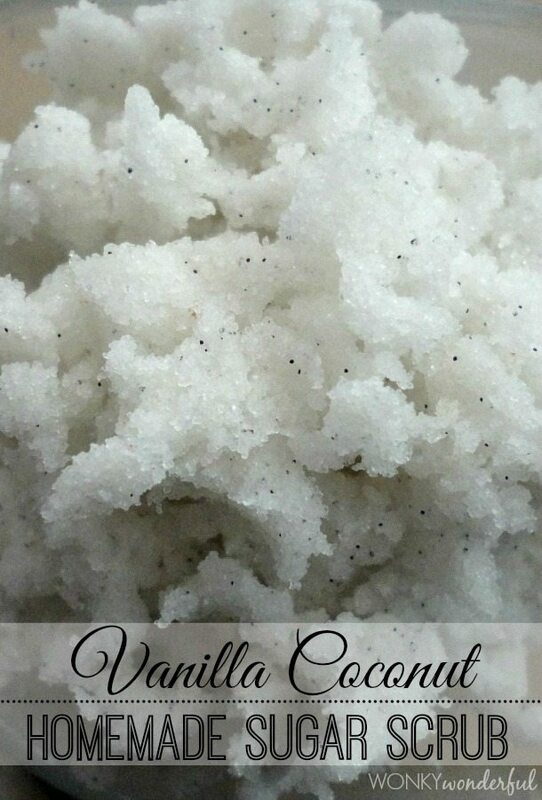 Or make a batch of luxurious Vanilla Coconut Sugar Scrub to pamper yourself with a spa night at home. 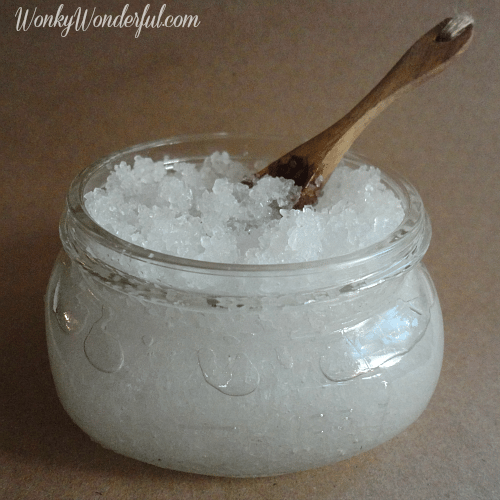 I love making Homemade Body Scrubs at home. 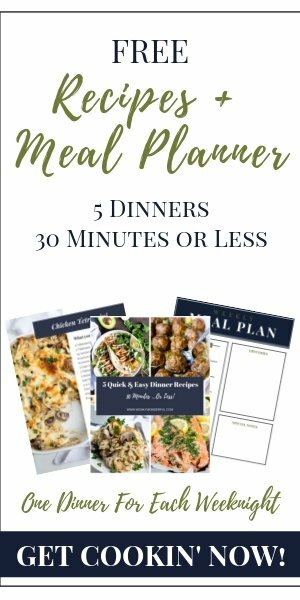 It is quick, easy and works just as well as the expensive store bought variety. 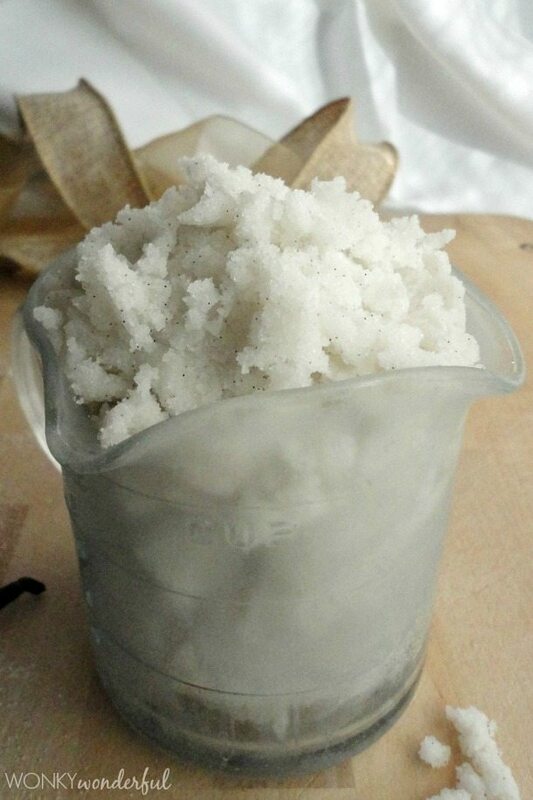 Plus, sugar scrubs are perfect for giving as homemade gifts to friends and family. 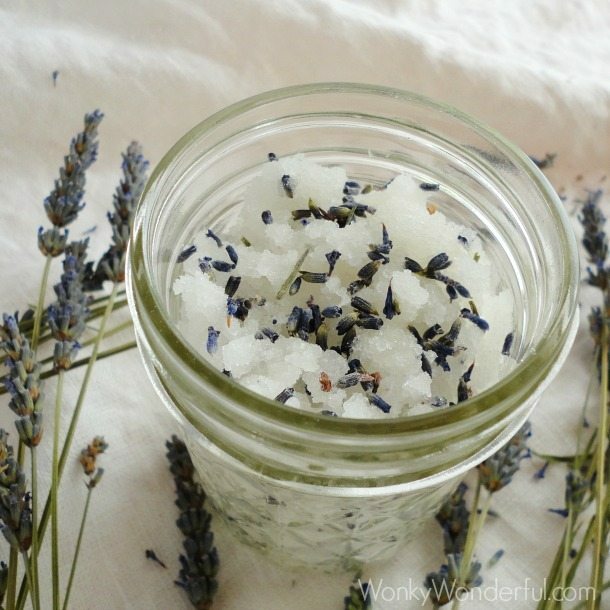 Fill a jar with your sparkling sugar scrub. Add a tag and ribbon to complete your fancy homemade gift! Usually when I am making a homemade body scrub, I just stir the ingredients together and call it good. Feel free to do the quick stir and done method. This time I decided to try something different. I whipped the coconut oil then added the sugar and vanilla. I like how it turned out. The sugar scrub feels creamier and fluffier than usual. 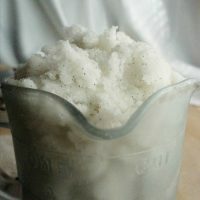 Of course, you have to use coconut oil in its solid form to whip it and keep the sugar scrub in a cool place. Otherwise the coconut oil will melt. No worries though, if it melts the scrub will work just as well. 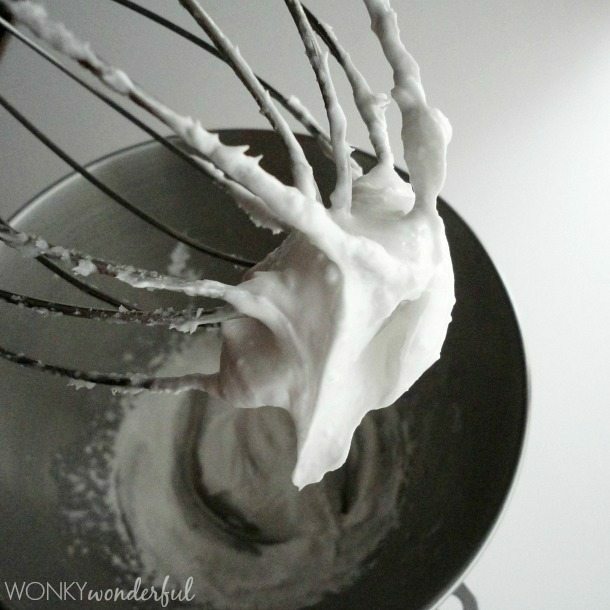 Use your whisk attachment on your mixer and whip 1/2 cup solid coconut oil for about 10 minutes. Stop to scrape down the sides after 5 minutes. Add 1 cup white sugar and the seeds from 1 vanilla pod. Mix for another 1-2 minutes. Transfer to an air tight container until ready for use. 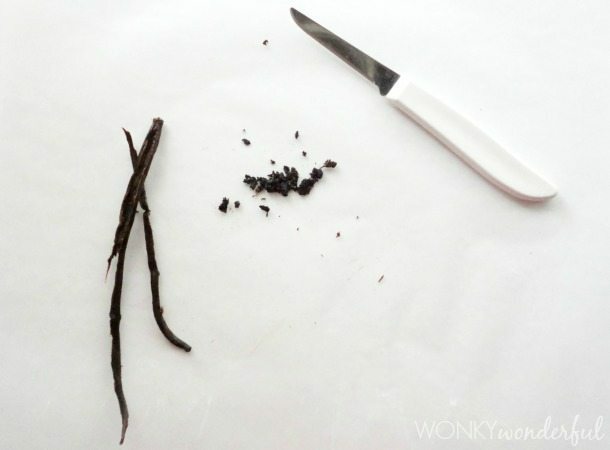 To prep the vanilla, split the pod lengthwise and scrape all of the tiny black seeds out with the tip of your knife. Don’t Discard The Pod! Check out more in depth instructions on prepping a vanilla pod and What To Do With A Vanilla Pod at theKitchn. I gently heated my leftover pod with some milk and sugar for a homemade vanilla coffee creamer. Add 1 cup white sugar and the seeds from 1 vanilla pod. Mix for another 1-2 minutes. Transfer to a Jar until ready for use. *Unrefined Coconut Oil is less processed and has a great natural coconut aroma. The scrub will have a coconut and vanilla scent. Refined Coconut Oil will work just fine but will not add the coconut scent. The scrub will have a plain vanilla scent. hello, I’m from Malaysia, can I used liquid coconut oil because its hard to find the solid coconut oil here.. and what will be the result and how long can I kept this ? Coconut oil in its liquid form will work too. I have kept my scrub for 6 months and beyond. I think it will last a long time if kept in a clean airtight container. I melted some coconut oil and added sugar. I poured the mixture into a container and let sit. I did not cover it. Now it is rock solid. Can you tell me what I did incorrect? 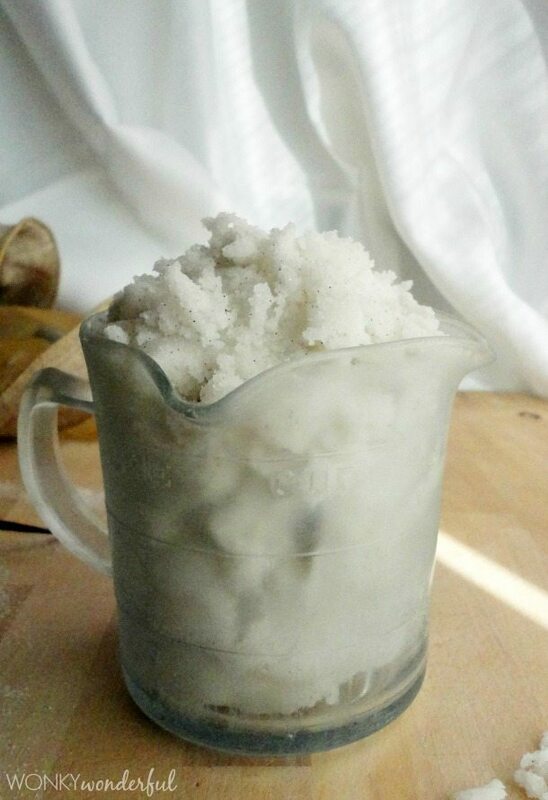 Coconut oil will become solid when cold and liquid when warm. If stored in a warm place it should remain more liquidy. Or, you can run the jar under hot water for a minute to loosen it up before use. How long does the “fluffiness” last once it is in the jar? Does it return to a more solid form? Where’s the best place to get vanilla bean pods?